OVERLAY TINT FILM for 2015-2019 Dodge CHALLENGER. Fits 2015-2019 DODGE CHALLENGER. This Overlay Tint Vinyl Film is applied onto your oem tail light, sidemarkers, reflectors . This overlay Precision Computer PRE-CUT film is a designed to bond to your lights with optically clear non-permanent adhesive giving your vehicle an aggressive look while not significantly changing the output color of your lights. G2 L.E.D. TAIL LIGHTS. 2008-2014 DODGE CHALLENGER. FIT: 2008-2014DODGE CHALLENGER ( ALL MODELS ). Warranty will be void for improper installation. OVERLAY TINT FILM for 2015-2019 Dodge CHALLENGER. Fits 2015-2019 DODGE CHALLENGER. This Overlay Tint Vinyl Film is applied onto your oem, sidemarkers, reflectors . This overlay Precision Computer PRE-CUT film is a designed to bond to your lights with optically clear non-permanent adhesive giving your vehicle an aggressive look while not significantly changing the output color of your lights. FIT DODGE CHALLENGER SE R/T SRT8 MODELS. 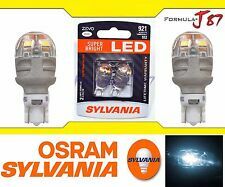 LED VERSION FOR BRAKE AND TURN SIGNAL. CENTER PANEL BULID-IN LED. Only Fit Dodge Challenger 2008-2014. Dodge Challenger 2008-2014. 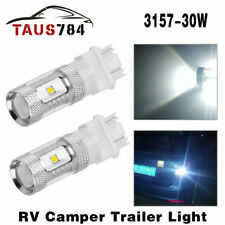 Brings a Different Appearance to Vehicle Thats Great for Show Use or to Replace Old and Worn Headlights&Tail Lights. Tail Lights. 1X pair of Headlights. The compatible vehicle lists is only partial lists,no fully included due o Ebay listing compatible vehicles limitation. 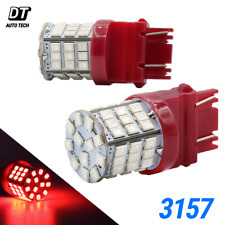 IF your car plug is 3157 3156，the item is fit your car This listing features 2 pieces of Brand New,Pure Red 3157 High Power 48 SMD LED bulbs ,which contains High power chips inside, comes with Projector Lens, plus 48 pcs 4014-smd. 360 degree light Angle! The result is amazing. It is an ideal addition to any vehicle. 10 watt output! Super Birght ! 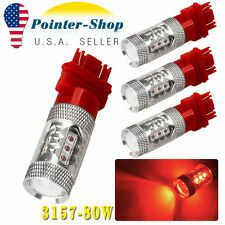 - high power 4014 LED chip Super Birght ! - 360 degree viewing angle eliminates hot spots maximizing assembly housing illumination - Non-polarity design, easier to install, just plug & play. OVERLAY TINT FILM for 2015-2019 Dodge CHALLENGER. This Overlay Tint Vinyl Film is applied onto your oem tail light . Fits 2015-2019 DODGE CHALLENGER. This overlay Precision Computer PRE-CUT film is a designed to bond to your lights with optically clear non-permanent adhesive giving your vehicle an aggressive look while not significantly changing the output color of your lights. Compatible with: 3157. 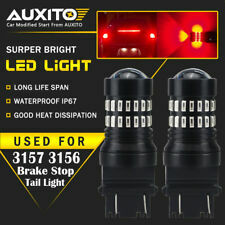 2X 3157/3156 High Power Red SMD LED Brake Stop Tail Turn siganl Light Bulbs. 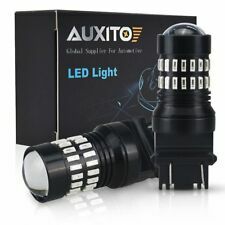 This is the high quality and produces super bright LED light bulbs that you've been waiting for so long, and it's producing intense light over a large area. OEM AUTO BODY PARTS. Don't forget to look at. For sale is a used passenger side 2009-2013 Dodge Challenger SRT-8 tail light. This light was removed from a 2009 Challenger. The light was tested before removed and is in 100% working condition. This taillight is in great used condition. Fog Light Assembly Fits Chrysler Town & Country 19-11039-00-9 TYC. 2010 Chrysler Sebring Fog Light Assembly Right. 2010 Chrysler Sebring Fog Light Assembly Left. 2011 Dodge Challenger Fog Light Assembly Left. Trending at $23.71eBay determines this price through a machine learned model of the product's sale prices within the last 90 days. Take out 2014 Dodge Challenger SRT-8 w/13k. Lens looks pretty nice. It is cracked and has a few different holes in it. The light did work before it was pulled. Headlight is PARTS ONLY. DeWitt, Iowa. Make Supersized Seem Small. Get Images that. Quality New and Used Parts at unbeatable prices! NORMAL WEAR / FEW SCRATCHES / TOP EDGE HAS LONG CRACK, MAY LEAK. - GENUINE DODGE ITEM. Lens is in good used condition, normal wear. Take off 2014 Challenger SRT-8. Will work in any year Challenger from 2008-2014. Perfect working condition. 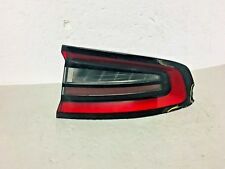 For sale is a used driver side 2009-2013 Dodge Challenger SRT-8 tail light. This light was removed from a 2009 Challenger. The light was tested before removed and is in 100% working condition. This taillight is in great used condition. Tail light. REAR CENTER. We do not take responsibility for any delay, that caused by weather condition or custom inspection. IF A PART IS MISSING FROM THE ATTACHED PICTURES. This Headlight Includes ONLY what you see on the Pictures. DEFECTED LED! This is an OEM part. THE LENS HAS LIGHT SCRATCHES.ALL TABS ARE GOOD AND INTACT. WE WILL BE HAPPY TO SOLVE THIS PROBLEM. Part: L Taillight. Model: CHALLENGER. CHALLENGER 2008 -2014 outer, L. Make: DODGE. Year: 2012. For Vehicle on Title Only. 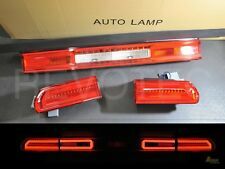 Used Trunk Mounted Tail Light in GOOD Working condition. Part is in good condition. Real pictures. Used original item. Its in overall good working condition, No broken mounting tabs. has light scuffs on lens from normal wear and a small pressure crack on the right lens corner, nothing major. See pictures for details. It does have normal wear. We do consider this to be in good used condition. It still could use a good cleaning. Interchange: 166-02429 11-14 Challenger center. LKQ SKU: LKQ720 ~201353639 TLP01494. We do our best to prevent these issues from happening and apologize for any inconvenience it may cause. Dodge Challenger 2008-2014 outer, L. Vehicle Model: Challenger. This is an OEM part. WE WILL BE HAPPY TO SOLVE THIS PROBLEM. Tail Light Assembly Fits Dodge Challenger 11-6740-00-1 TYC. 2015 Dodge Challenger Tail Light Assembly Left. 2016 Dodge Challenger Tail Light Assembly Left. Components Included Complete Assembly. erosion, including effects of salt-air corrosion and. The taillights on your Dodge Challenger play an important role when it comes to safety. Not only do they alert other drivers to your presence on the road, especially at night, but they also let other drivers know that you are braking or preparing to turn. If you find that you need to replace your Challenger's taillights, you will find a wide variety of options. What components make up a taillight? Bulbs: The bulbs are the components that actually produce a bright glow when you hit the brakes or turn on your vehicle's turn signal. Taillight assemblies generally have multiple bulbs that all do different things. Lens: The lens is the acrylic piece that amplifies the beam produced by the bulbs. This component can also provide some protection for the bulbs if your Dodge Challenger goes over large bumps in the road. Housing: This component holds the wiring, the lights, and the lens in place. It also provides the point of connection to the body of your Challenger. The housing can have a number of different finishes that change the appearance of your car. What are the bulb types? Incandescent: These bright lights burn hot and allow other drivers to easily see them. They have a small amount of halogen gas inside. When it is turned on, the tungsten is evaporated. When it is turned off, the halogen gas helps redeposit the tungsten on the filament so that it can be turned on again. This cycle allows incandescents to be burned for about 1,000 hours before they need to be replaced. Xenon: The lights reach full intensity almost instantly, meaning they are safe and allow drivers to see them as soon as you hit the brakes or the turn signal. They contain a cathode and an anode. An electric spark passes between the two, igniting the small amount of xenon gas inside. LEDs: Tail lamps that utilize LEDs usually have clusters that work together to create a strong glow. LEDs are energy-efficient and use very little of the Dodge Challenger's battery and alternator. What types of lens styles are there? Tinted: Tinted lenses are commonly found in taillights. These lenses are tinted the color of the lights you need. For example, the lenses over the brake lighting will be tinted red, while they are tinted amber for turn signals. Clear: In some types of taillights, the lenses are clear. The lighting components are tinted instead, creating unique taillights for your Dodge Challenger.